In his second and final year with the Avalanche, outside hitter Patrik Toze is a bonafide PACWEST star. 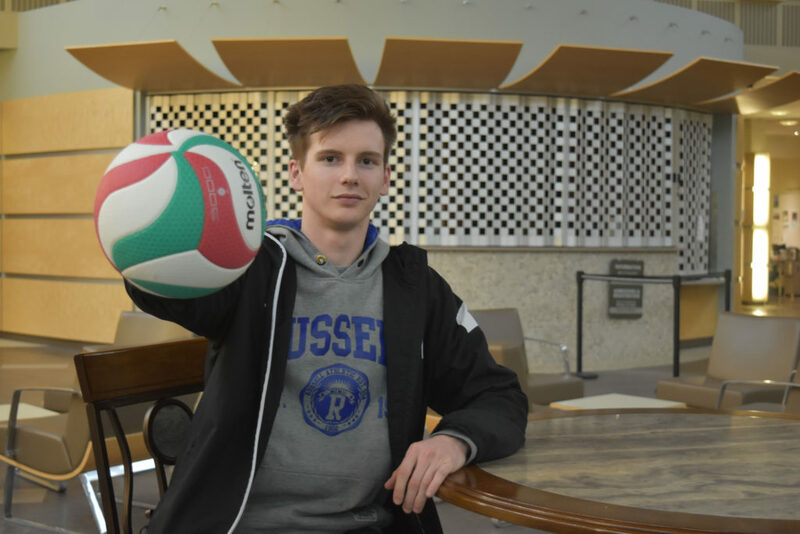 The young Australian may be a long way from home, but whenever he steps on the volleyball court, there is no doubt that he’s exactly where he belongs. The way Patrik Toze began his volleyball career isn’t your typical story of a future star. He wasn’t born dreaming of playing the sport, wasn’t a prodigy, and it wasn’t even his idea to start playing. “I started in eighth grade, just in high school, nothing special. I started off riding the bench, you know, nothing crazy,” Toze says, explaining that his initial desire to play volleyball was mostly based on it being an indoor activity. Growing up, Toze was always playing sports and before he took up volleyball, he already had experience with soccer, basketball, rugby, cricket, tennis, swimming, track and field, and Aussie rules football. It wasn’t until he was in his final year of high school that he began to seriously believe he had a future in volleyball. Although Cranbrook is a lot different than Brisbane, where he spent the majority of his youth, Toze didn’t take long to acclimatize and to love his new home. Coming from a city of over two million people, Toze has also enjoyed the small-town feel of Cranbrook immensely and it’s certainly helped stave off homesickness. He says that within weeks after arriving last September, the intimate feel of the town and the college campus gave him a feeling of belonging. While he was just happy to be a member of the family, his personal accolades quickly piled up in his rookie season with the Avalanche. In 2015-16 he was named the men’s team MVP and Rookie of the Year, while also being named the top rookie for the entire PACWEST. In addition, he was named to the conference’s All-Rookie and 1st All-Star teams. These sorts of awards were nothing new for Toze. In Australia, he had been named the 2014 under-19 state most valuable player. He was also the most valuable player for the State Schools Cup, as well as the Aggregate Interschool College Cup in 2013, in which Toze holds national records in blocking, spiking and service aces. But for someone who has so much clout to his name, he doesn’t really talk about himself much at all. His attention is all on his teammates — his adopted family — and they trump any trophy or record. When asked what he’d like to accomplish this year, he quickly put the focus on others. “Getting my grades to a high level [is important] but probably number one for me is winning provincials. It’s just, these guys, they work so hard, we really want to get there. He says the bond between Avalanche teammates is unparalleled. Despite only being a sophomore, this season will be Toze’s last with the Avalanche as the kinesiology program he is currently taking only lasts two years. He recently committed to attend Mount Royal University in Calgary next season, where he will continue his education, and move up to the CIS, the highest level of university athletics in Canada. Toze’s focus right now, however, is squarely on winning the PACWEST’s ultimate prize, and, of course, out-performing the women’s team. Toze says that watching the women win the conference championship last year by defeating VIU, the top team in the country, was an amazing and inspirational moment. Now, it’s up to him and his teammates to take what they learned from the women last year and do it themselves. After losing in all four of their opening matches on Vancouver Island against VIU and Camosun, Toze led the Avs to two straight home victories against Douglas College over the weekend. He sees enormous potential in this year’s squad. With his immediate future already mapped out and a tight bond with his teammates locked in, there is very little for Toze to worry about right now. Although he says he misses warm temperature in the winter and thinks he might be getting a little too pale for an Australian, he’s having a great time in Canada and it can only keep getting better. But will he lead the Avalanche to a championship in his final season?